No, not fishing with silverware, silly! Fishing with lures called spoons that are either going to catch you that legendary fish, or give you that legendary fishing story. The name spoons is almost a metaphor, like saying you are putting food on your plate. You have a wide selection of different spoons available, some spoons have been used for over half a century. With that level of experience, they can’t be wrong can they? After over 75 years of usage, could anyone honestly say that this the regular spoon doctor does not work? The great thing about this lure is that you can catch fish at almost any speed, it comes in 5 different sizes and was made for freshwater and saltwater. Doctor Ice, meet patient fish, patient fish, meet plate! The Doctor Ice Spoon comes in two different sizes and a large selection of finishes and designs. This is an ice fishing lure, and it is best used with live bait, plastic bait or by itself. Another thing to note with this spoon is that it is small but deadly. This lure has been designed so that it can accomplish long casting as well as deep trolling. The casting series is so heavy, you can cast the casting series into the wind without a problem. If you want a big game, then you will get a big game with the fish you catch from this lure. This lure’s name is no joke. It is the biggest spoon and was intended for trolling big game fish. What you get from the design of this lure is bright tinsel tails, which means that this lure will attract fish from a greater distance. This lure is plated with high grade precious metals, and it is deadly, coming with eagle claw hooks. This lure is brilliant for Lake Trout, Muskies, Salmon, Northern and Rainbows. The name does exactly what it says. It cuts down on the amount of weeds that your lures get when you troll. It took over 60 years, but finally it has arrived. With the Weedless Doctor Spoon, you can go through the toughest cover and catch the monsters that hide there. The Weedless Doctor comes in four sizes and six finishes. 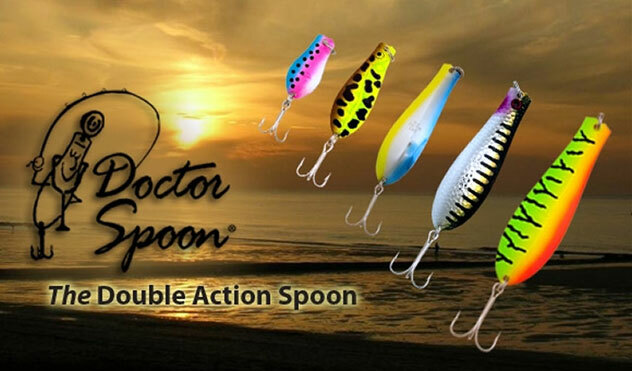 Up until recently, Thin Doctor Spoon was a closely guarded secret by the best of fishermen. What you get with this lure is a spring tempered brass, deadly flutter action even at the lower speeds and the option of different finishes. These finishes come in the colors of real gold, silver or copper plating. There are also three different sizes and this lure can be used in freshwater or saltwater. Much like its brother, the Thin Doctor Spoon, the Great Lakes Series is a thin doctor. It comes in many bright colors and it too light to cast into the wind. However, it is a terrific trolling lure. You also have a massive selection of beautiful finishes for this spoon. Doctor Spoons are manufactured and distributed by Yellow Bird Products, 100% made in the USA!